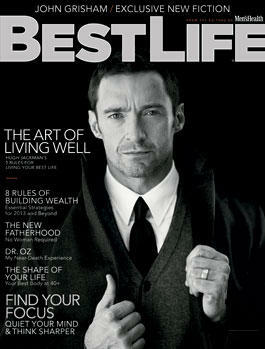 Hugh Jackman graces the cover of the newly revamped Best Life magazine. 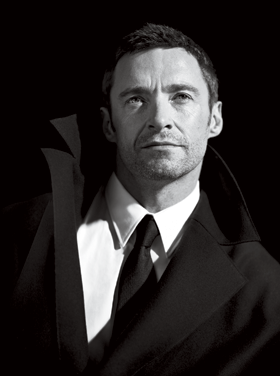 He is photographed by Richard Phibbs. Here is what Hugh shared with Best Life. My transformation covers about 30 years. At the beginning, my character is released from prison, which was basically a labor camp. He’s emaciated yet known for his strength. So I was as lean and strong as I think I’ve ever been. I had sunken cheeks, this sallow look. Then in a matter of weeks during filming, the story jumps 9 years. I’m the mayor of the town and wealthy, so I had to change my look. So it took me about 3 months to get into that shape to be a convict, and then during 3 months of shooting I was eating nonstop and was 30 pounds heavier when we finished. That tees up with where I have to be for Wolverine. I’ve never heard my dad say a bad word about anybody,” he says. “He always keeps his emotions in check and is a true gentleman. I was taught that losing it was indulgent, a selfish act.